Home > Events > Moon Mermaid & The Pirates "The Treasures Of Friendship"
There are many legends about mermaids and even a few dozen historical claims of supposedly “real” mermaid sightings. Hundreds of years ago, sailors and residents in coastal towns around the world told of their encounters with sea-maidens. One particular story dating back to the early 1600s, claimed that a mermaid had entered Holland through a dike. Injured in the process, she was taken to a nearby lake and was soon nursed back to health. Some researchers believe that sightings of human-size ocean animals such as Manatees and Dugongs might have inspired many merfolk legends. These animals have a flat tail and two flippers that resemble stubby arms — traits that may make them resemble merfolk. They don’t look exactly like typical mermaids or mermen of course, but many sightings were from quite a distance away and since they were mostly submerged in water only parts of their bodies were visible. A glimpse of a head, arm or tail just before it dives under the waves might have spawned at least some mermaid reports. Hollywood has their own take on Mermaid lore with such finery as “Splash” and “Mako Mermaids” However, we can assure you, real they are. 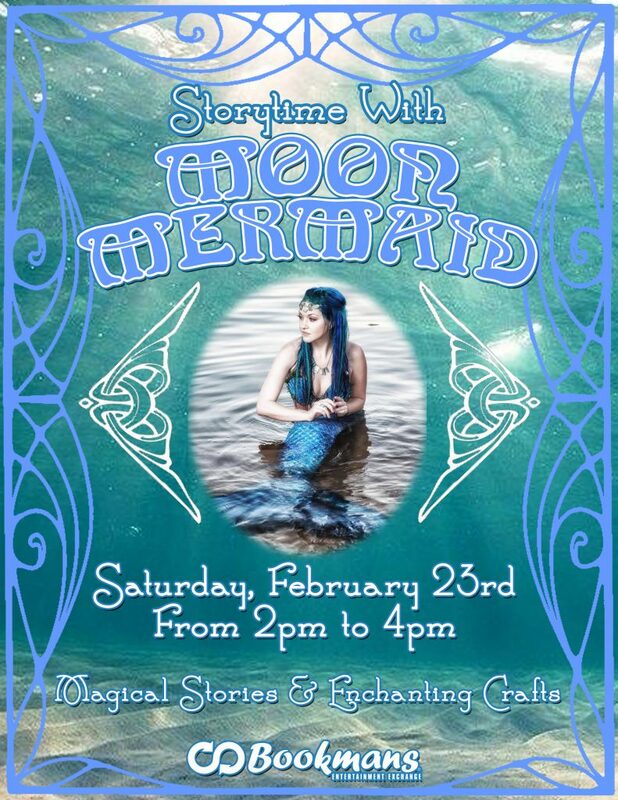 Moon Mermaid will have her land legs and is heading back to Bookmans Entertainment Exchange in Mesa today for a fun story time with treasure, magic, and friends! Stop in for FREE family fun and a fin~tastic story, treasures, and learn all about Moon’s book’s “The Treasures of Friendship” and “Moon Mermaid and the Pirates. There will be plenty of photo opportunities so don’t forget those cameras! Don’t be a guppy and miss this exciting event!